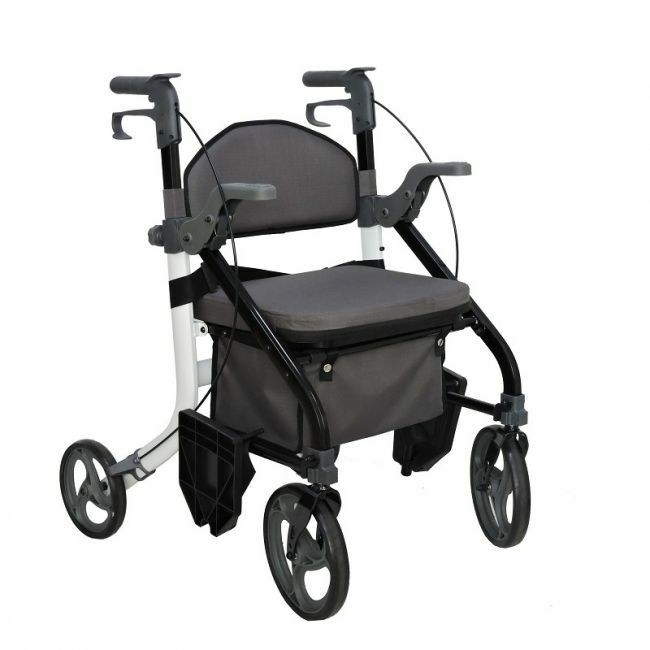 Can be used as a standard rollator, then with the addition of the footrest which are stored under the seat it becomes a transport wheelchair. with padded seat and brakes. Larger 8" castors for indoor and outdoor use. Padded upholstered backrest with small pocket on the back. Footrests can be stored under the seat or hooked on facing backwards out of the way. Padded seat with useful storage bag underneath. Attractive Black and White finish. Height: 86cm / 33.9" - 98cm / 38.6"
Seat Height: 54cm / 21.3"
Seat Width: 44cm / 17.3"
Seat Depth: 30cm / 11.8"
Max user weight: 136kgs / 21 stone. Gap betweeen the handles: 45cm / 17.7"
Boxed Size: 59cm / 23.2" x 53cm / 20.9" x 31cm / 12.2"